The current Caltrain station in South San Francisco is located on the east side of US 101, on Dubuque Avenue under the East Grand Avenue overpass. Pedestrian and bicycle access to the station is difficult due to its location. Connection between downtown and the station is extremely poor, and SamTrans buses cannot negotiate the tight curves on accesses to the station. 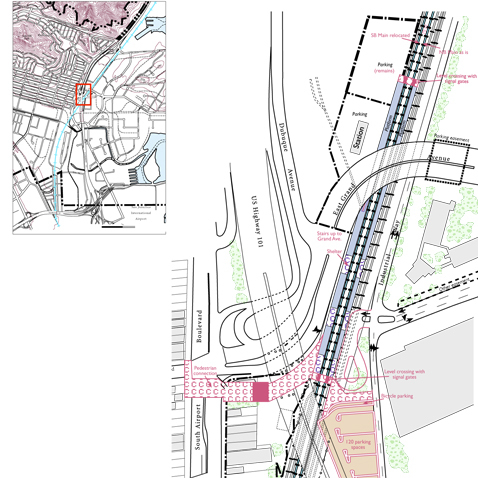 The study, prepared by Dyett & Bhatia for the City, recommends relocating the station southward, with direct bus drop-off and pedestrian access from downtown, and shuttle access from the eastern side to serve the growing employment in the East of 101 area. Removal of a portion of the freight tracks and relocating the southbound main line are also recommended. These proposals would result in vastly improved pedestrian and transit access with minimal expensive improvements, such as construction of overpasses. The study is in the process of currently being implemented by the Peninsula Corridor Joint Powers Board.